would you like a bite of fall? 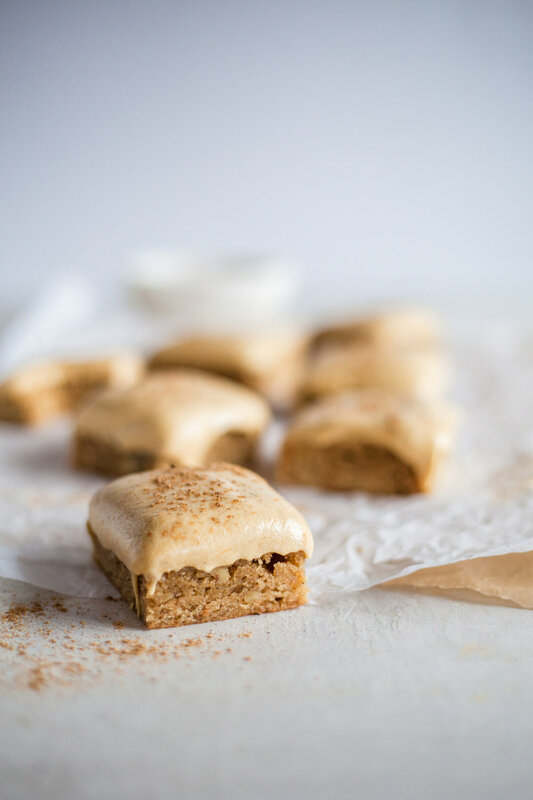 these blondies are exploding with fall flavor. they taste and smell like the months of october, november, and december combined. make your own chai blend! this has been so cozy to have extra around for sprinkling on various thangs. it smells amazing, and it’s pretty to boot. adding the chai spice to hot water with some raw sugar is a super easy instant chai tea and is super spicy and flavorful. it would also be amahzing in hot apple cider, on ice creams, on oatmeal, yogurt, etc etc etc! the blondies are made with olive oil, which is pritty kewl. you can make them with butter if you prefer. the texture will be delightful either way. boy. i had no idea how tricky this frosting would be when i decided to make it pumpkin cream cheese. sounds simple, yeah? whell, it took me 3 tries to get it right. i’m super glad i didn’t throw in the towel, because the final product turned out mega deliciouuuus. i was getting way confident in how much pumpkin purée i could throw into the frosting……turns out, that just ain’t allowed. unless you fancy grainy glop on your brownies and/or cakes. never fear, failed frosting #1 actually ended up becoming a pumpkin sweet bread recipe the next day with a bit of tweaking, haha. i do not like to waste. 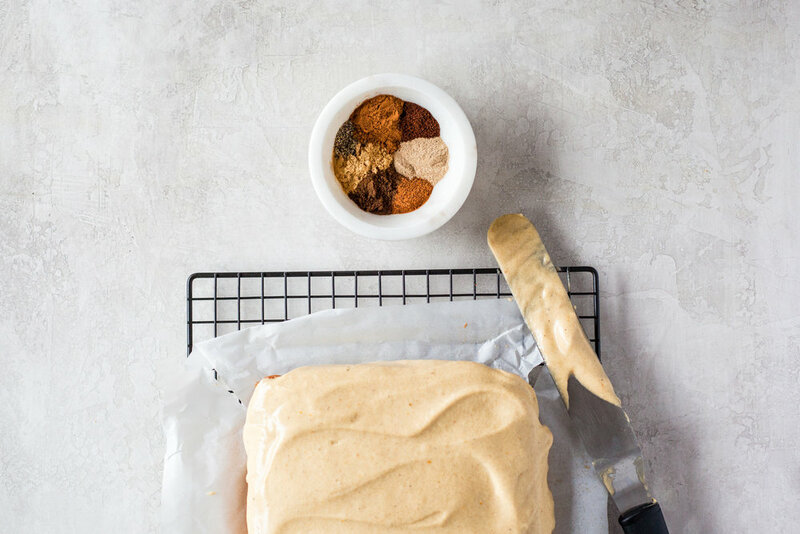 you can only add barely TWO TABLESPOONS of pumpkin to the frosting. or else, grainsville. my first attempt - i put in 1 CUP of pumpkin. lololol. what a mess. also, sifting the powdered sugar is very important. 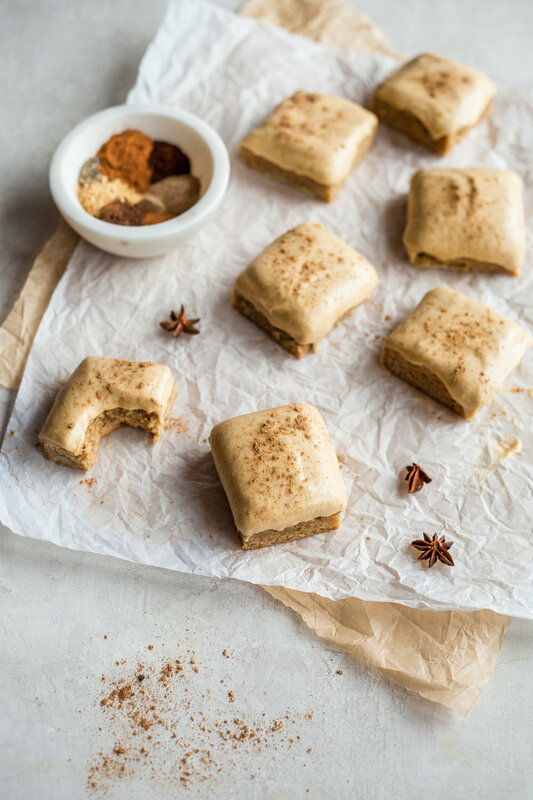 then use pumpkin pie spice and the chai spice blend to bring out that pumpkin flavor without adding any extra liquid to the frosting. 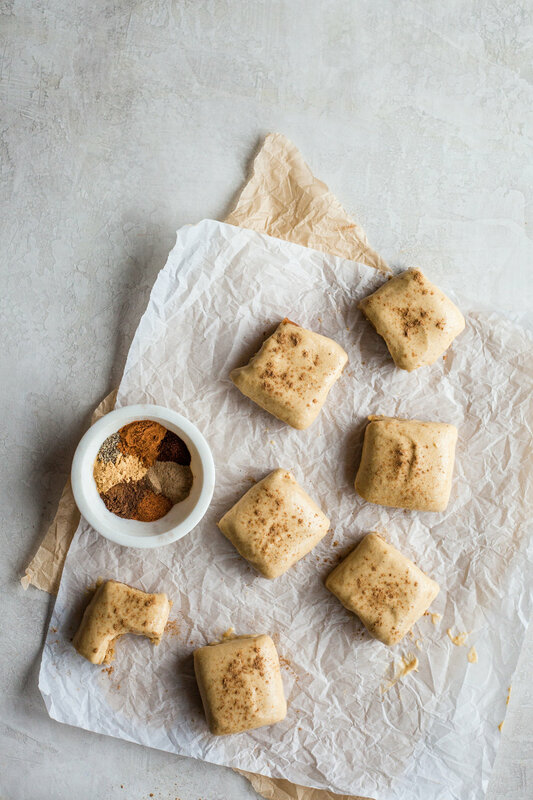 the bars are perfectly chewy and spiced like chai - with some bits of walnut, which i love. and the frosting has a combination of sweet and sour(ish) flavors with the pumpkin, powdered suga and cream cheese. these are an all around fall’s delight. 2 cups powdered sugar, sifted! Preheat oven to 350 degrees F. Spray an 8 x 4 inch (for 1” thick bars) or 4 x 4 inch pan (for 2” thick bars) with cooking spray and line with parchment paper. If doubling the recipe, use an 8 x 8 inch square pan and also about double the bake time. In a large bowl, combine the dry base ingredients for the blondies. In a medium bowl, combine the wet ingredients. Make the chai spice blend in a completely separate bowl or container to store for later. Chop the walnuts. Add 1 1/2 tsp. of the chai spice blend to the dry ingredients. Add the wet ingredients to the dry ingredients bowl and stir to combine. Fold in the chopped walnuts. Spread batter into prepared pan and spread evenly. Bake for 18 minutes, or until toothpick inserted in the center of the blondies comes clean. Allow them to cool in the pan for 10 minutes, then carefully lift the parchment to set blondies on a cooling rack to cool completely. In a stand mixer or using an electric hand mixer, cream together the butter and cream cheese until fluffy. Add the pumpkin purée and mix again (DO NOT add more pumpkin than the recipe calls for - frosting will turn very grainy as a result). 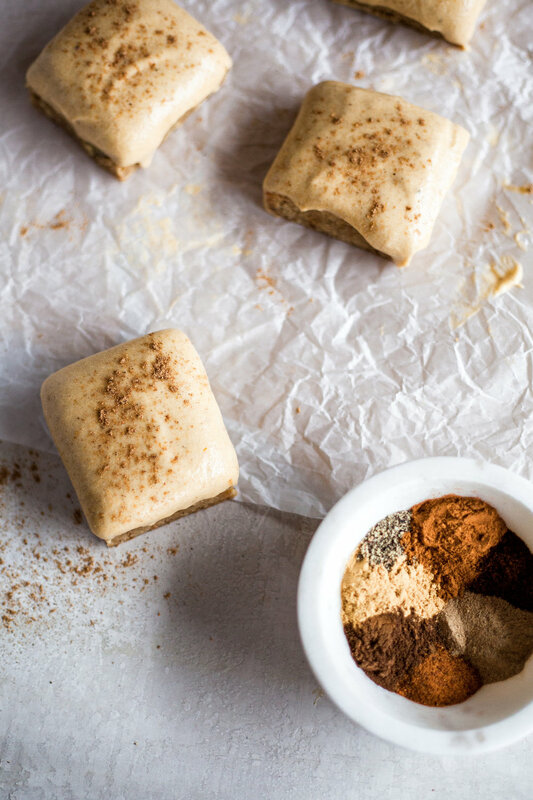 Add the chai blend and pumpkin pie spice to bring out the pumpkin flavor. SIFT the powdered sugar before slowly adding to the mixing bowl. Sifting is key to keeping the frosting smooth. Continue to mix/whisk on medium speed until all the powdered sugar is added and frosting is fluffy, scraping down the sides of the bowl with a spatula as needed. Add vanilla extract and a pinch of salt and mix for a couple more minutes. Lift the cooled blondies onto a large cutting board. Use spatula, butter knife, or offset spatula to spread the frosting onto the blondies. Carefully cut into squares with a large knife. Serve same-day!